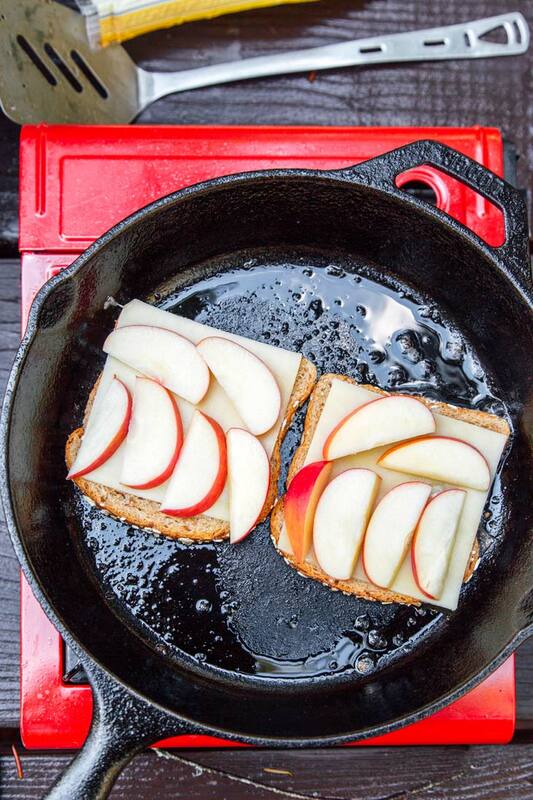 Upgrade your grilled cheese game with this apple bacon grilled cheese sandwich! Stuffed with white cheddar, sweet seasonal apples, and crispy bacon, this is the quick and easy lunch idea you’ve been waiting for. We love grilled cheese sandwiches. They’re simple, easy to make, and open to a lot of individual customization. They’re also a great answer to the eternal question of what to make for lunch- especially if you’re burnt out on cold cuts and prefer a warm meal instead. 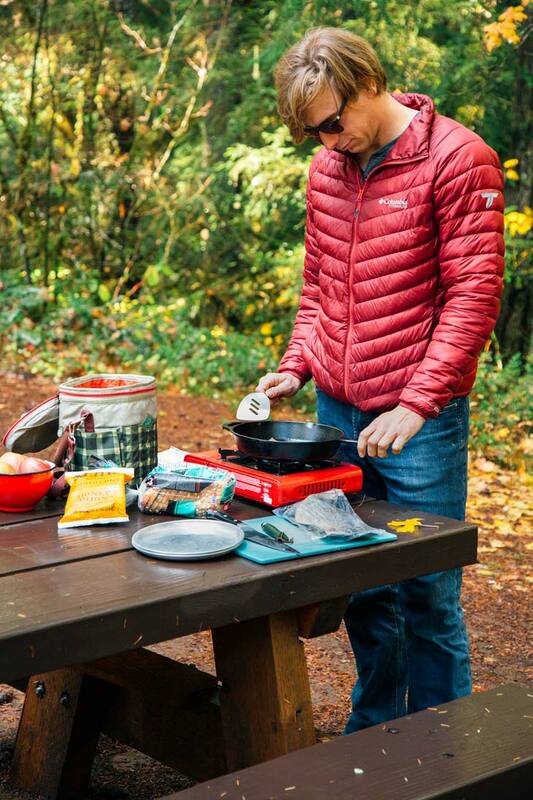 Making grilled cheese is usually a cinch at home, but they can be a bit of a challenge to make outside when it’s cold. Depending on the temperature, it can be difficult to get the butter to an appropriate semi-soft state to spread across a slice of bread. We’ve torn up a lot of bread trying to make rockhard cold butter work. (Spoiler Alert: It doesn’t). So for this recipe, we decided to do anyway with the butter entirely. What!? Do away with butter? But what about the flavor?? True, we would be robbing a lot of flavor from our grilled cheese if we did away with the butter and didn’t replace it with anything. But instead of butter, we replaced it with the delicious flavor of bacon! By frying a few strips of bacon in the pan beforehand, not only do we get to add bacon to the sandwich, but we also get bacon fat with which to fry our bread in. If you haven’t tried bacon fried toast before, you’re in for a treat! To give this sandwich a little extra fall flavor, we also added a few slices of apple. This gives each bite a slight pop of sweetness as well as a bit of crunch. But if you really want to add a lot of crunch to this sandwich, then we recommend adding in some chips. We developed this recipe in partnership with Kettle Brand and made it using their Honey Dijon chips (perhaps our favorite flavor). 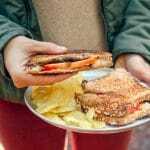 While this grilled cheese sandwich doesn’t include any condiments, by serving these sandwiches with Honey Dijon chips (or sneaking a few into our sandwiches! ), we get both a crispy crunch and sweet honey mustard flavor all-in-one. Bacon, cheddar, apples, and chips. 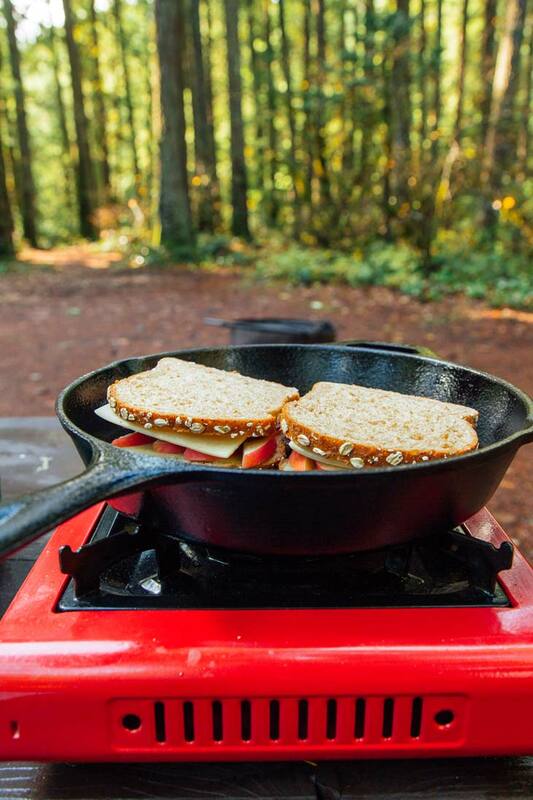 What more could we ask for in a camping lunch? 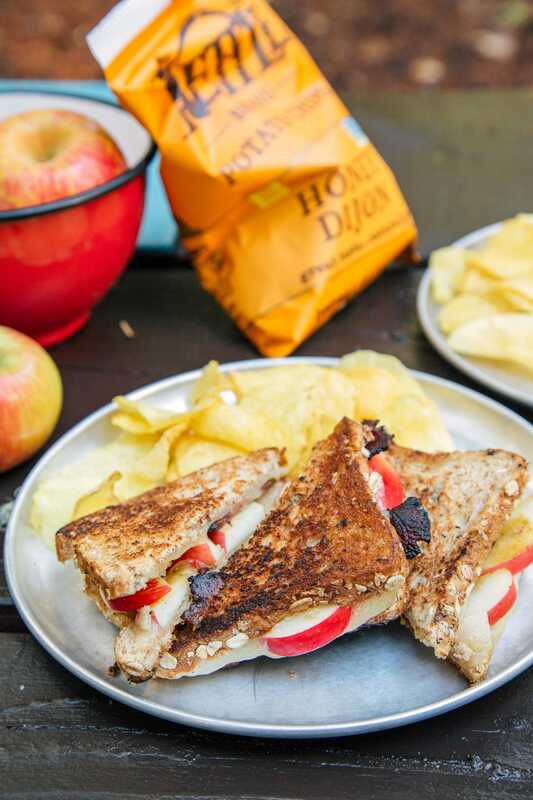 So if you’re looking for a warm lunch idea to make this autumn, give this Apple Bacon Grilled Cheese a try! 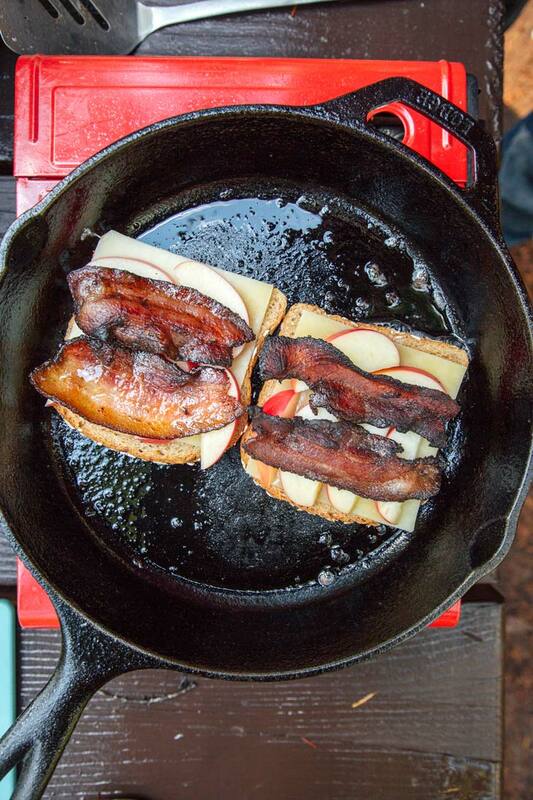 Crispy bacon, sweet apples, and white cheddar - this upgraded grilled cheese is a great camping lunch idea that can be cooked in a skillet over the campfire or on your camp stove. Set a skillet over medium-low heat and add the bacon. Cook, flipping as needed until some of the fat has rendered out and the bacon is cooked to your liking. Remove and place on a paper towel-lined plate. Increase the heat to medium and add two slices of bread. On each slice of bread, layer half the cheese, apples, and bacon, and then top with the second slices of bread. Cook until the bottom of the sandwich is golden brown and the cheese begins to melt, then flip to cook the other side. 1. drop the pat of butter in the center of your pan on low heat so it starts to melt. 2. Take a slice of bread, and smear it in the pool of melted butter. I stack the slices of bread with buttered ends facing each other, and when ready I’ll assemble my grilled cheese. It works great every time! Super awesome. Never thought bacon and apple could also be a combination. Yummy! Why i didn’t knew about this site it’s such a gold!